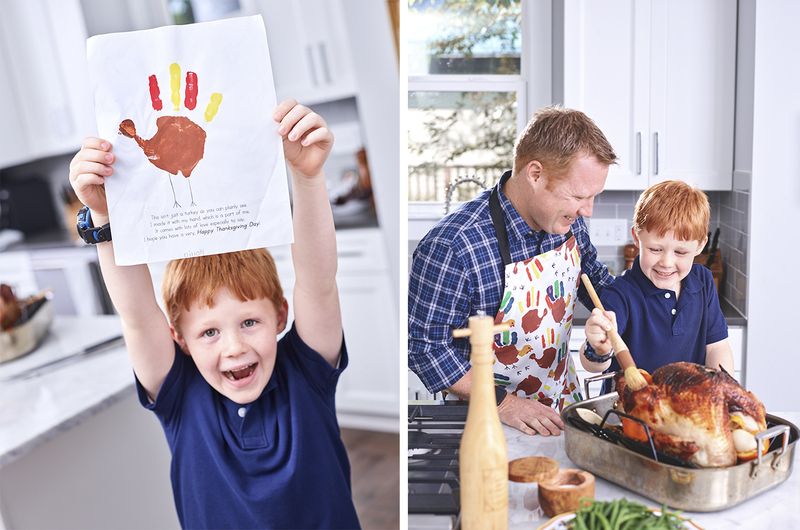 With a little help from Spoonflower, you can transform your child’s artwork into one-of-a-kind keepsakes for family and caregivers. 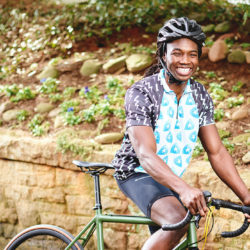 Before you get started making one (or all!) of the 10 DIY projects we’ve rounded up, be sure to brush up on your design skills with this repeating pattern tutorial. For additional design help, we suggest this list of eight seamless repeat design tutorials. New to designing fabric? Don’t fret! A majority of these projects can be completed with just a scanner. 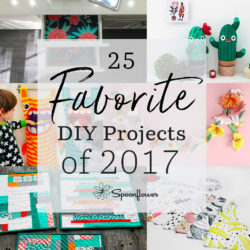 Ready to see which projects are inspiring us? Nothing could make your kid prouder than seeing their masterpiece displayed on a tea towel. (Future heirloom alert!) Finish your tea towels with a mitered corner for a professional finish or skip the DIY and order a ready-made tea towel through Roostery. Just upload your design to your Spoonflower account, login to Roostery and preview your design on the tea towel page to get started. 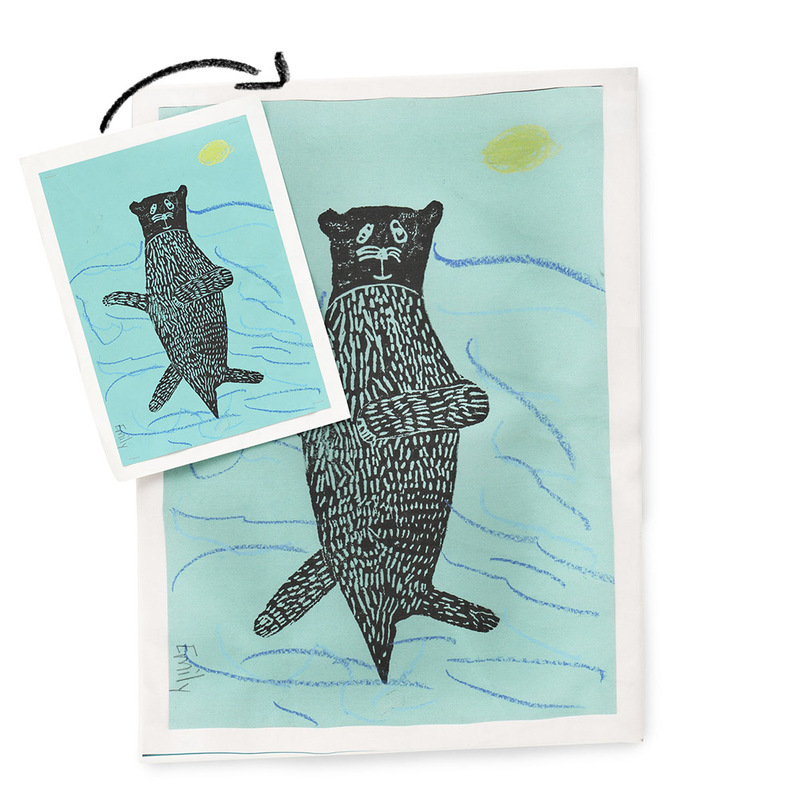 Pro tip: To ensure a picture-perfect Roostery tea towel, see how to format your design here. Looking for a better way to hang onto your kids’ creations instead of a revolving cast of fridge decorations? One of our favorite projects to highlight their artwork is DIY aprons. Just imagine the entire family in matching aprons while baking cookies for the holidays! Pick out your favorite apron style to get started. You won’t believe how easy—and inexpensive—it is to make custom artwork with Linen Cotton Canvas and some stretcher bars. Create an entire gallery wall featuring the artwork you’ve collected over the years or design custom portraits for the entire family. See how with this video tutorial. 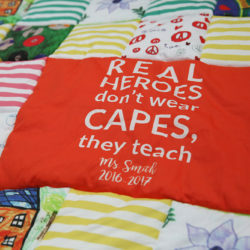 Need a little help dreaming up a thoughtful teacher gift? 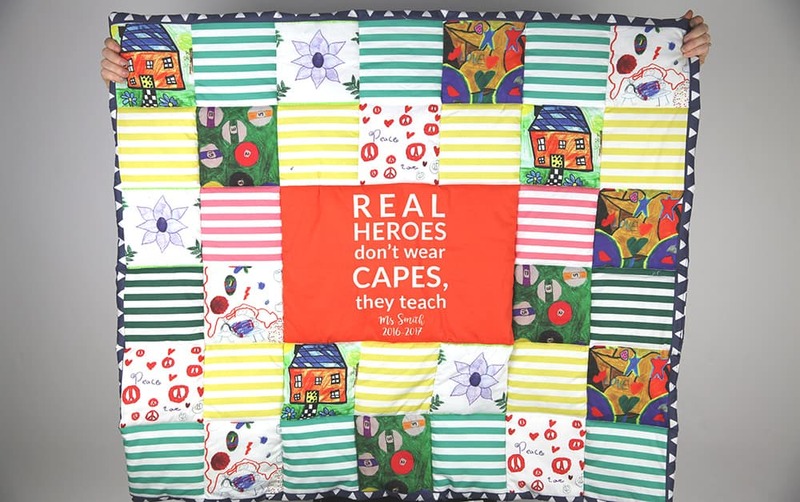 A custom classroom quilt featuring artwork by the budding artists in the classroom is guaranteed to be a hit. Using the Cheater Quilt Fill-A-Yard™ template, this project can be completed in just a few hours. 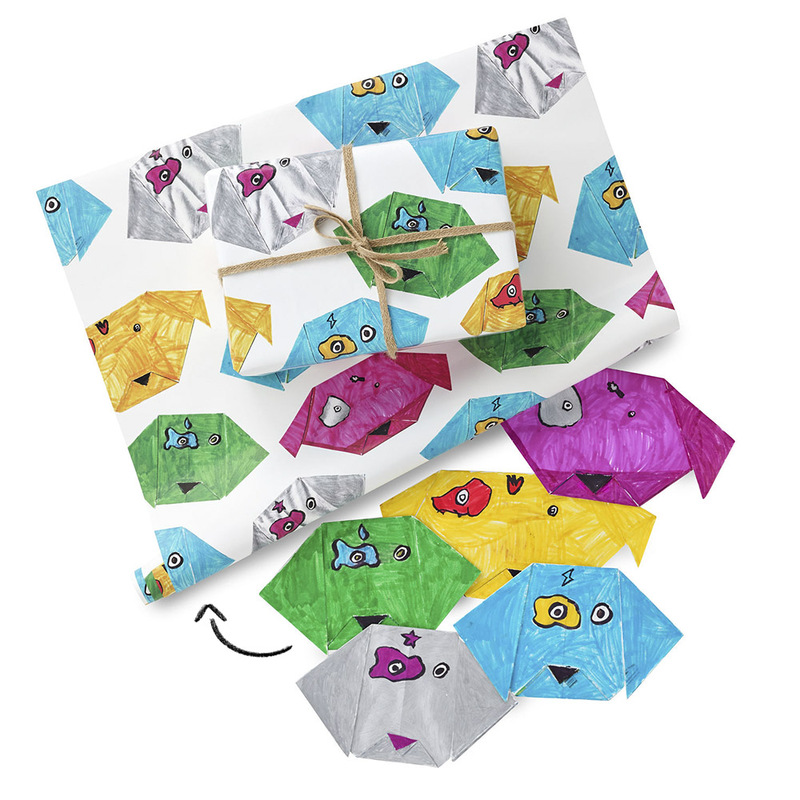 Cut out your little one’s art and create a design for custom gift wrap to surprise grandparents or teachers. 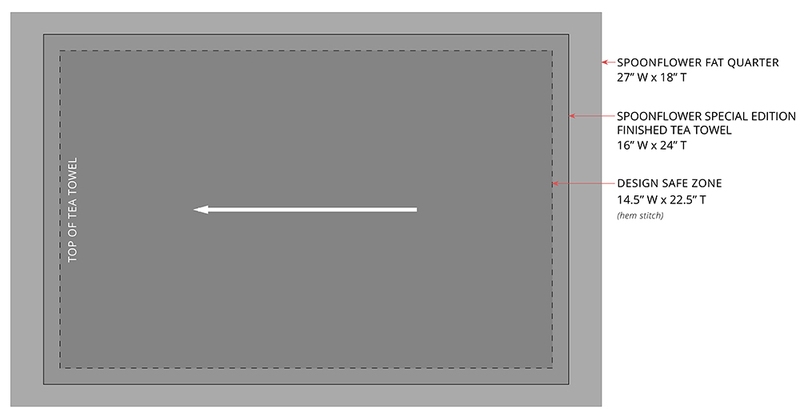 New to digital design? See how to take their artwork from paper to pixel here. What does every well-dressed kids’ table need? A custom table runner featuring their very own artwork! 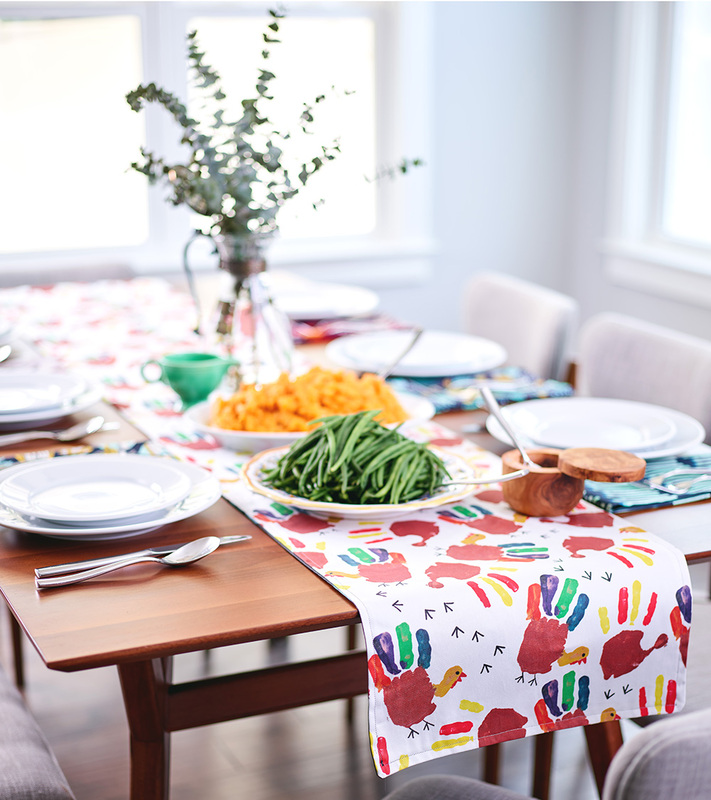 Take a classic turkey handprint, paper snowflake cutout or a drawing of their version of a winter wonderland, and transform it into fabric to personalize their table. Pro tip: Entertain for two different occasions using the same runner by making it reversible! 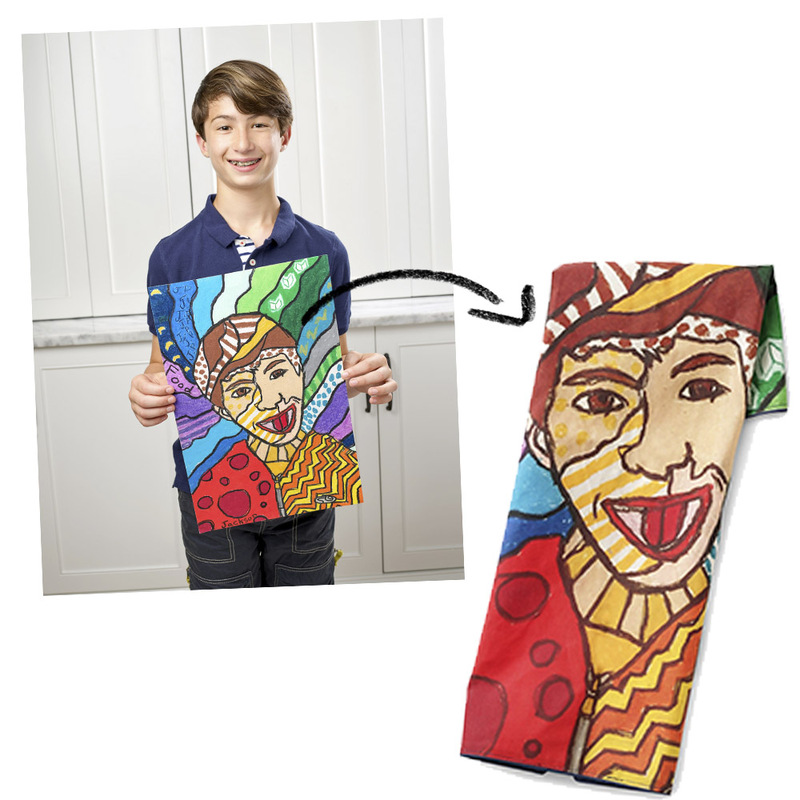 Feature kid’s artwork on one side and a more sophisticated design from the Marketplace on the other. 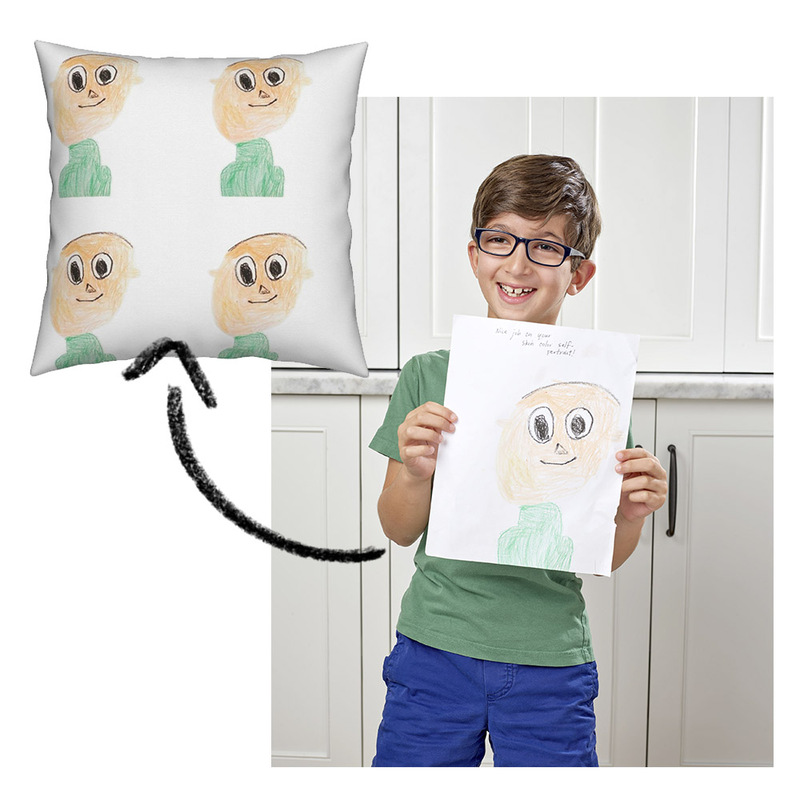 Fun little drawings can have big impact when turned into a repeating pattern on a throw pillow. See how to sew a simple zipper pillow with Lia Griffith or order a pillow (choose from two styles!) directly from Roostery. 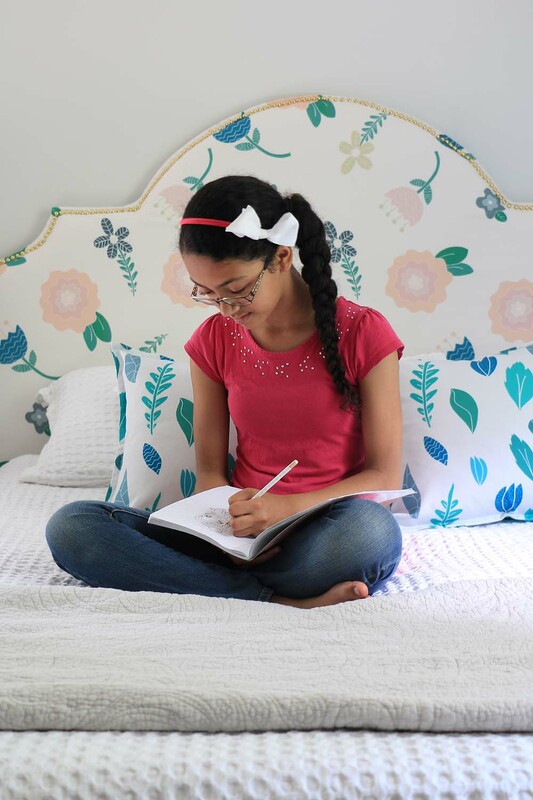 Take kid’s artwork from doodle to dream room with a DIY headboard. 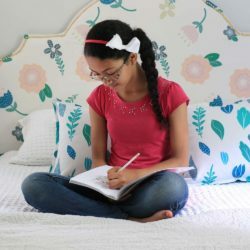 Ursula Carmona, founder of DIY design blog Home Made by Carmona, teamed up with her daughter to create a custom design featuring for her bedroom makeover. Read even more about how the dynamic design-duo worked together on the project here. Just imagine the reaction you’ll get when you surprise the little one in your life with a stuffed animal featuring their artwork! 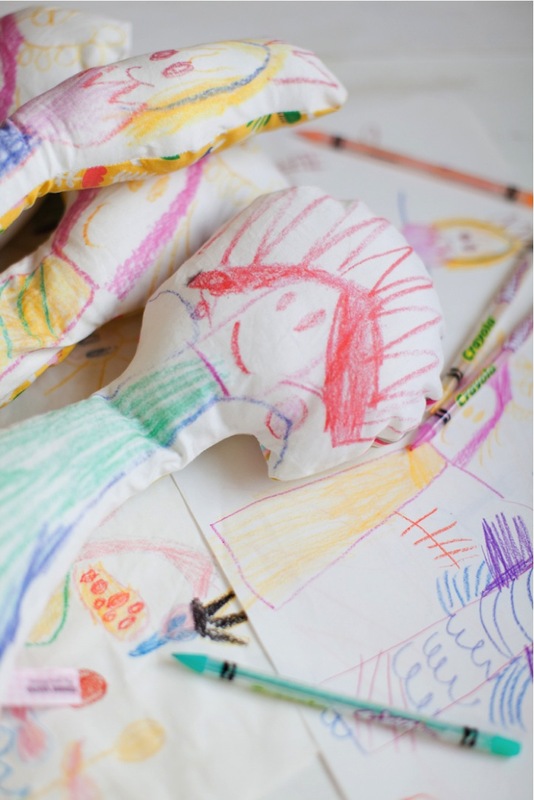 Audrey of This Little Street took her daughter’s drawings and turned them into fabric dolls and you can do it too following this beginner-friendly tutorial. Are you ready to take home the prize for making the most thoughtful/orignal/tear-worthy gift for Grandma and Grandpa? We’re sure Albertina, the blogger behind Mimosa Lane, took home this prize when she presented Grandma with a pineapple dress featuring her daughter’s artwork. Lucky for you, Albertina is sharing how you can recreate the project! We love the idea of inviting your little ones to help with making these DIY gift ideas! 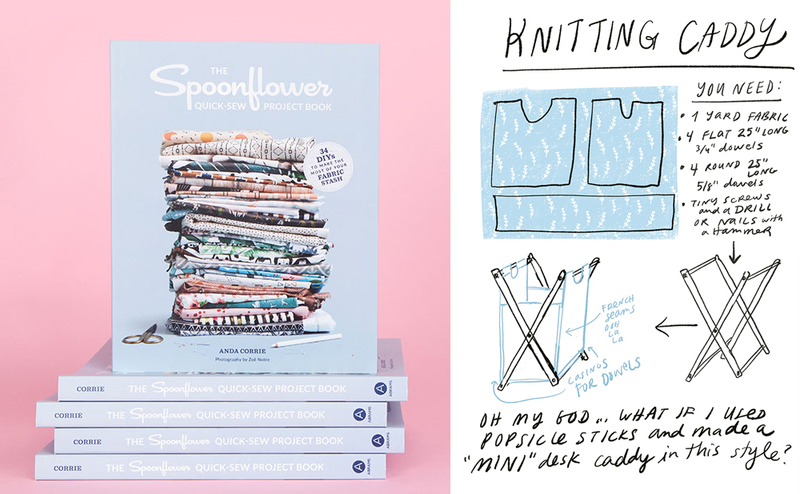 For even more hands-on sewing with your kids, be sure to grab a copy of our newest book, The Spoonflower Quick-Sew Project Book by Anda Corrie.